Whether you’re racing professionally or just enjoying a casual track day, minor adjustments can give you a crucial edge over the competition (or your pals). I spoke to two one-make pro racers, Porsche GT3 Cup drivers Michael de Quesada and Matt Campbell, about the circumstances they encounter at the track and the tweaks their teams make to give them an advantage. In trial laps, “You need to get to the edge of what you can do with the current car setup. Then you analyze what changes you can make,” says de Quesada. To that end, tweaks to the car are made after a detailed study of its performance. This combined analysis, through the lenses of both experience and hard data, helps make minor adjustments more impactful. The entire team contributes, from the driver in the cockpit, to the engineers in the garage, to the analysts who pull data directly from the on-board computer. “Data doesn’t lie,” says de Quesada. Campbell adds, “Engineers gorge on data. They pore over log data. There’s more tech to improve driving now than ever before.” And for drivers, their trust in their team’s interpretation of that data is paramount when preparing for a race. Once the data has spoken, which adjustments prove most impactful? Campbell finds that shock adjustments grant the greatest returns, while de Quesada feels it’s more of a case-by-case thing. “There’s not one particular element over another,” he says. “We encounter different circuits with different circumstances that require a range of approaches.” That means taking on each race as a unique set of variables, and doing your best to equip your car with the abilities to race it properly, efficiently, and, of course, quickly. Balancing these tweaks against what the rules dictate mean that the race team’s engineers — the people who ultimately make these decisions — consult a great deal of science and math before making any change, whether it’s before the start of the race, in the pit, or on the fly in the cockpit. And these adjustments are all interconnected. Take camber. Camber changes are made to find a balance between improved corner handling versus higher straightaway speeds. What’s more, camber and ride height are intrinsically linked, as a positive adjusting of the camber will change the angle at which the tire makes contact with the track, thereby lowering the ride height. This gives the car better aerodynamics and less wind resistance, which ultimately = more speed. 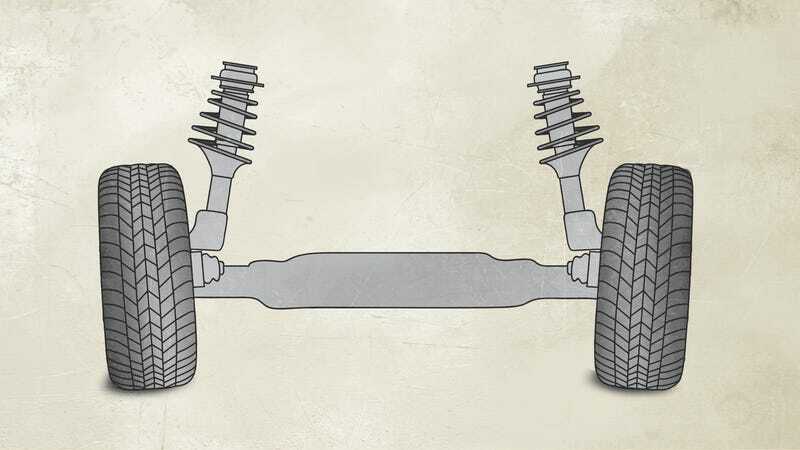 Similarly, adjustments to the shocks can counterbalance that lowering, raising the car if cambering makes it too low for proper clearance. If balancing the ride height creates too much space under the car, then engineers will look to the angle of the wing to help keep the car firmly planted on the track. Ultimately, the trick is to find the right configuration of all these adjustable factors that maximizes speed, traction, and aerodynamics. Next time you watch a race, don’t just notice the quickness of a pit stop, the sheer brutality of the pressure a driver endures, or the quick thinking needed to calculate angles as they rush towards a turn. Instead, also notice the height of the car, the angle of the wing, and the camber of the wheels to remind yourself that that big win came from intense analysis and tweaking the tiniest details. John Sciarrino is a freelance writer who covers cars, tech, and gaming. He is based in New York City.